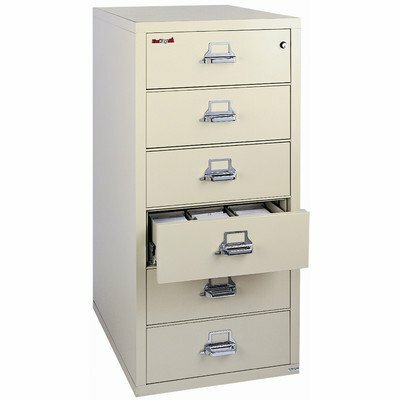 6-2552-C (parchment) Finish: Parchment, Lock: Key Lock Features: -Two-position drawer catch allows access to certain drawers while others remain locked. -Insulation between all drawers makes each one a separate insulated container. -Field-replaceable steel panels allow for easy replacement of damaged panels. -Drawer pulls are surface-mounted to allow for extra insulation inside the drawer heads. -Drawer heads are formed of welded steel and filled with fireproof gypsum insulation. -Drawer suspensions are maintenance-free and guaranteed for life. Product Type: -Vertical filing cabinet. Style: -Traditional. Locking: -Yes. Primary Material: -Metal. Number of Items Included: -3. Commercial Use: -Yes. Fire Resistant: -Yes. Drawers Included: -Yes. Drawer Type: -Letter. Country of Manufacture: -United States. Dimensions: Overall Height - Top to Bottom: -52.75". Overall Width - Side to Side: -25.25". Overall Depth - Front to Back: -31.5". Overall Product Weight: -863 lbs. Specifications: GSA Approved: -Yes.